Use this to give a speech and increase charisma skill. Information is a valuable commodity, and that is why dispensation of it must be done with care and thought. It is for that reason that we provide this handy kiosk from which anyone can setup their own information delivery station. Of course the kiosk as provided is information free, but it does make a lovely addition to any corporate area. This gnome actually springs into action during the day and tirelessly waters your flowers. It never needs enchanting. This solar powered gardener will water your plants and flowers as long as the sun shines bright. The use of this object will summon all ghosts on the lot. Whenever a sim reads the powerful words within, the spirits of the departed will be transiently reborn. This objects will prompt children in costumes to visit your house in the evening. You greet them and then they take some candy. Yum, Candy! Let's face it - kids love candy! Use this dish of yummy sugar-packed treats for a little surprise! After evening, little sugar crazed minions swarm your home! When someone plays with this toy, it will grow into the full-sized bozo, who will then try to burn down your house. It is a lot of fun! Sims will not play with the toy on their own, only at your suggestion. In the days of the Great Three Ring Circus, Bozo the Clown was Master of the Ring of Fire. Sims from all over SimNation flocked to his daring pyrotechnics act. In the height of glory, hundreds of figurines were made in his likeness. But inevitably the gasoline fumes consumed Bozo's sanity, and his show literally went up in smoke. As Bozo was hauled away in a straight jack, he swore destruction through all images of himself. Needless to say, production of his figurines immediately halted, but many can yet be found adorning an enthusiast's home. Empress Mei Mei ruled her island nation with a stylish panache not seen since. One of her most-remembered extravagances was the cake she commissioned for her wedding: a towering monument to baked decadence. Everyone loves an ant farm! Watch in mystery as the little arthropods dig twisting tunnels and convey ponderous debris. When properly cared for, this terrarium can provide months of enlightening revelry. Youngsters adore staring at entrapped Lasius neoniger within the glass walls. Perhaps someday they will major in Entomology. Or possibly they might pull out their dusty copy of SimAnt to vanquish the red ants and conquer the yard! Can you control the ants, or will they control you? If you don't care for your ants, they may starve or escape. Do you want an ant infested house with matching anthills on the lawn? This download also includes the bug bomb, useful for killing numerous pests. Use this object to earn money. The higher your logic skill, the more you earn. 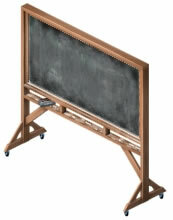 You'll look positively Euclidian in the eyes of your colleagues as you demonstrate theorems and integrate derivatives on this university-grade chalkboard. Eager universities and private corporations may even pay you for your brilliance. Expand your mind as you fatten your wallet! "The QED Chalkboard: mathematically proven." The perfect solution for the obsessed fan!!! Place the stakeout on non-home lots to generate the security guard. On home lots, buy the stakeout and then hire a security guard over the phone. He offers 24 hour protection against the obsessed fan for only $400 a day. No charge on non-home lots. This is the stakeout of the most elite crime fighting security guards. Nothing can get past a well trained security guard's eye. Be sure to hire a security guard once you place this in your home. When placed on any other lot, the guard will automatically show up for the job. Security guards are the best way to protect yourself from overzealous fans. For your next wedding, consider decorating with balloons. They're low-cost, festive, and hassle-free! No more arguing, fighting, or pleading with your guests to "please, PLEASE take some flowers with you!" The Croonmeister Mic. As soon as you hear the first, amplified note, you'll know that you're experiencing the finest in retro-techno. Its built-in multi-wave, high/low-pass filters will make you sound mellow and mid-range. Adjustable stand included, crescendos extra. Save money in the jar at home, or leave your waiter a tip downtown. Like what your host has done for you? Leave a tip in the "Owner Access Only" tip jar, as a way to say "Thank you". These two have crossed a sea of bliss,..On wings of love, ..Onto the shore of joy,..Along the road of unity,..To the city of peace,..Into the chapel of love,..Whence they will flee,..While we throw things at them. "As you grapple with Evil in the great Wrestling Ring of Life, when Injustice has you in a headlock, Temptation has its knee in your back, Hatred is twisting and twisting and TWISTING your arm, and the forces of Darkness are giving you an UNGODLY wedgie, remember that the Almighty will never, EVER throw in the towel for you!" -- Rev. Sebastian "Thunder" Hyde. Speak your mind. Say it like it is. Lay it on the line. Nothing better than a Sternn lectern to set people straight. Use this object to earn money. The higher your creativity skill, the more you earn. This strange device, uncovered during an archaeological dig, uses mechanical "strikers" activated by "keys" which are pressed by "hand" to produce legible writing -- all without the use of any software or Internet connection whatsoever! A true miracle of the ancient world. 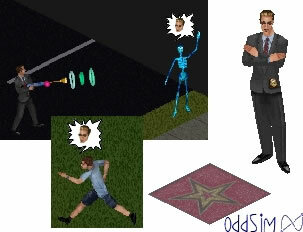 Clever Sims will even find it to be a creative outlet and a source of some profit! No expansion packs are required; but the more of them that you have, the more you can do with the Hat Rack! You can find all kinds of cool stuff on this hat rack. Plenty of hats and lots of glasses and other props! Have fun dressing your sim up as goofy as you want! Dress up like the Grim Reaper, a clown, or a super hero! Loads of props to keep you going! Save money in the piggy bank at home. Save up your money and buy that dream toy or house someday. This is great for any pool! It actually floats on the water! Eating this cake maxes out all your Sim's needs. This is a fast, one time pick-me-up! Can you beleive that people will PAY your sims money to store nuclear waste? You can't "buy" this object, instead it let's you call Miss Crumplebottom. Invite the old prude over to your house anytime with this phone plug-in. Have a blast with the old lady at all your parties. Black. Sleek. Plain. When it's time to dispose of trash, why not do it plainly? No home is complete without "The Original Trash Can." So clean up your act while you clean up your room... and give your trash a touch of old fashion. The Great Depression was a great starting point for the Parker Brothers to get a hit game and now today there are hundreds of versions of this game. This freestanding Monopoly set is a classic with a price to match.